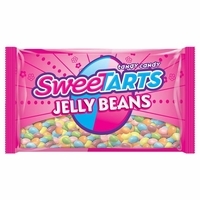 Sweet tart jelly beans you get sweet and tart and tangy all in one great jelly bean. Each bag comes with 6 assorted fruit flavors. You get Orange, Cherry, Lemon, Lime, Grape and a Punch. With a crunchy candy shell and a chewy tangy jelly center. The flavors are not only a mixture of sweet and tart, but they have a bold long lasting flavor as well. If you are a sweet tart lover we also have sweet tart gummy bunnies for those who like gummy candy. For those who like the traditional sweet tart candy we have sweet tart chicks, ducks and bunnies. The same great hard sweet tart candy just in Easter Shapes.